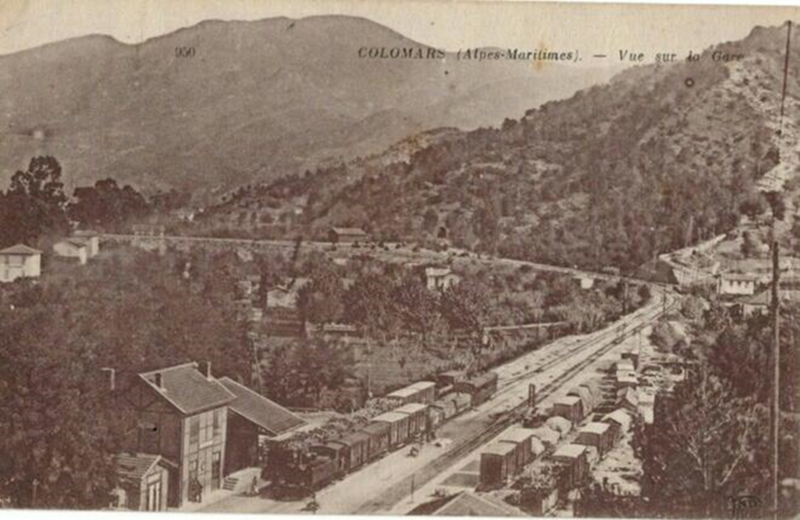 Background information on the companies which built the locomotives which served on the Central Var line can be found by reading my post on the locomotives of the Coastal Line – Le Macaron. In this next series of posts we will focus on the locomotives and rolling stock rather than primarily on their manufacturers and specifically on the locomotives and rolling stock used on the Central Var railway line. There are stories to tell about the history of some of the major French manufacturers of locomotives but they are stories for another time and place. Later there was a concerted effort to modernise the whole network and a series of diesel railcars were purchased. More about these in a later post. This first post pulls together a number of pictures of the steam locomotives on the Central Var line, and with the aid of friends on the Passions Metrique et Etroite forum, particularly 242T66, and the help he has given in accessing the french text of the book by Jose Banaudo, I attempt to provide useful and interesting reflections. I hope that all of these posts on Les Chemins de Fer du Sud de La France in Provence will enable English readers to appreciate the extent and diversity of the metre-gauge lines in Provence and perhaps as a result to investigate the amazing network of these lines which supplemented the standard gauge network in France. 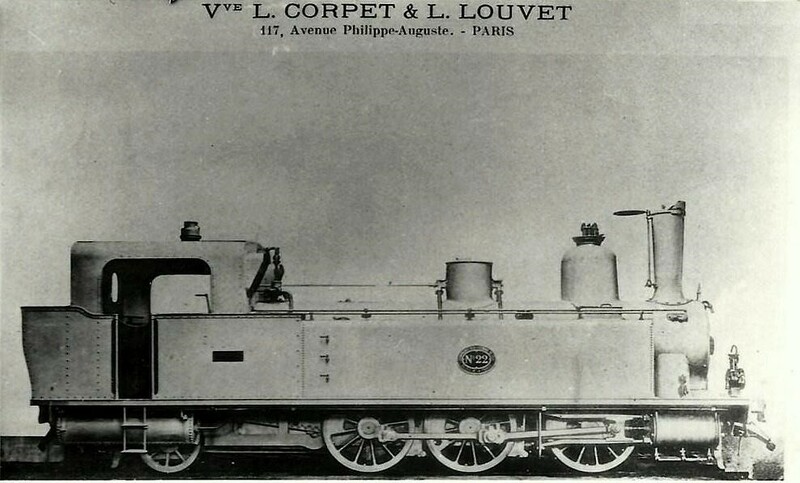 Later, other locomotives were purchased …..These Locomotives included some from the manufacturer Franco-Belge as well as SACM, Pinguely and Corpet-Louvet. In the first decade of the 20th Century, Pinguely 4-6-0T locomotives were ordered. The close-up shot shown below is taken at Toulon, but these locomotives also served on the Central Var Line. Very similar 4-6-0T locomotives were ordered from SACM. The image below is one used on the Macaron but it is identical in design to ones used on the Central Var line. Details of these locomotives and pictures of them operating on the Central Var line can be found below. Locomotive No. 89 is a 4-6-0T Pinguely (Works No. 192) delivered in November 1905 and remodelled in 1949. 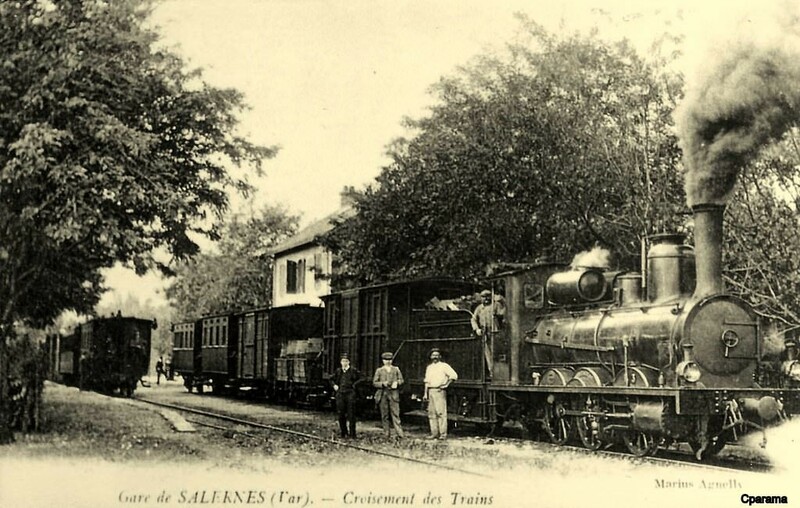 Sérié E of Les Chemins de Fer du Sud de la France, it is part of a series of 12 locomotives delivered between August 1905 and December 1907. The whole network including the coastal line had a total of 28 E and F Series 4-6-0T locomotives, supplied by several manufacturers. No. 89 was scrapped in January 1951. 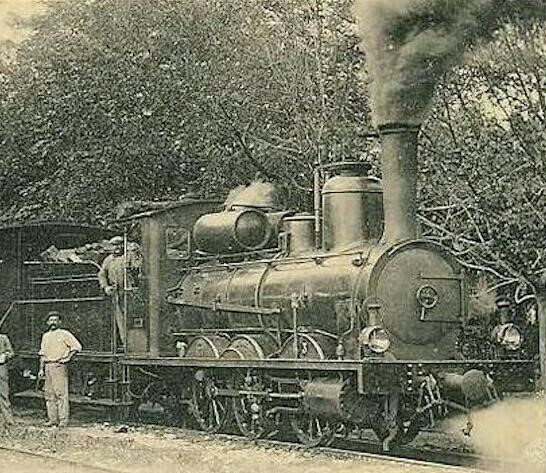 According to José Banaudo, these 4-6-0T locomotives were the best steam engines on the network. The picture of SF No. 89 was taken at La Manda Station. This is the best head-on picture of a Pinguely 4-6-0T engine that I have discovered. It is difficult to distinguish between the different 4-6-0T locomotives on many of the postcard images available today. 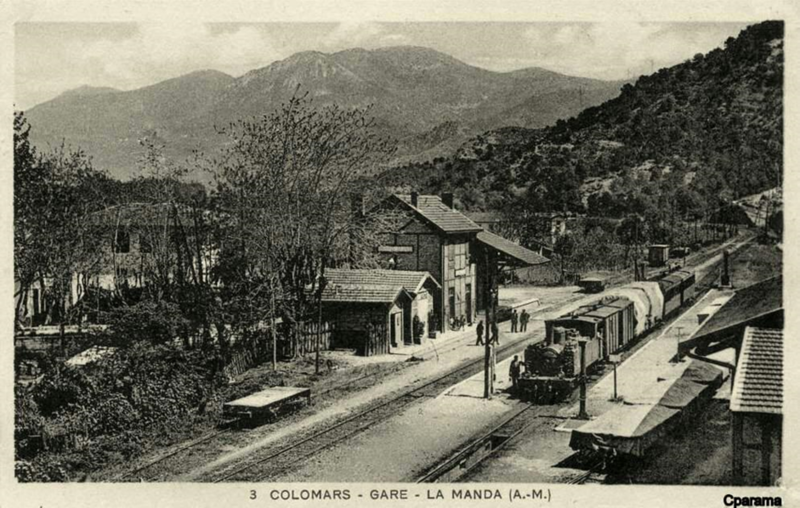 For example, there are two images of the La Manda Station near Colomars below. 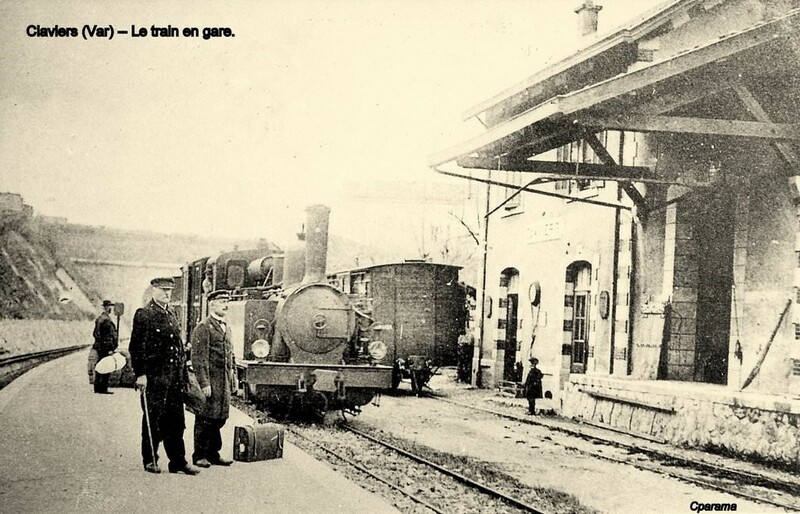 In the first image it appears that the locomotive is a 4-6-0T but the resolution of the image is not good enough to determine whether it was made by Pinguely or SACM. 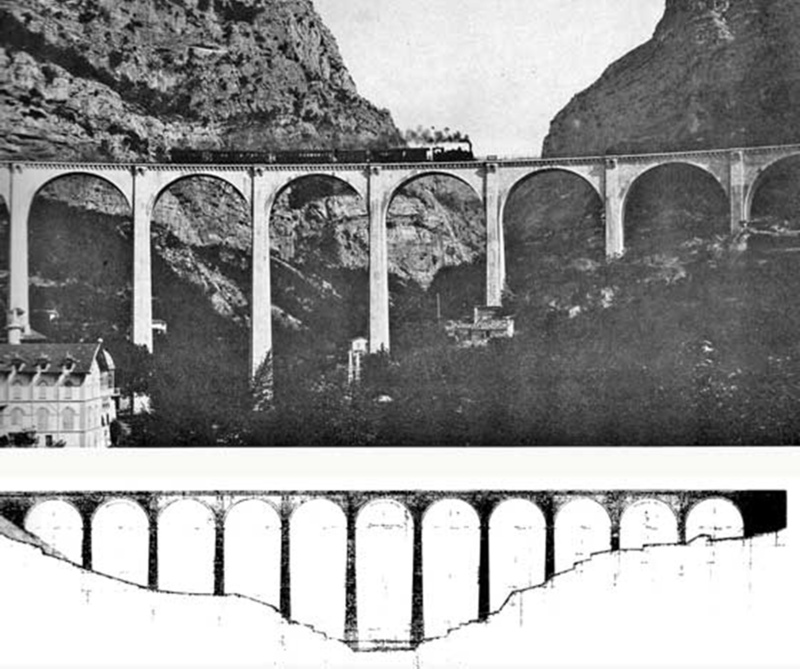 The second image appears in Jose Banaudo’s book (reference  below) and on the CPArama website. 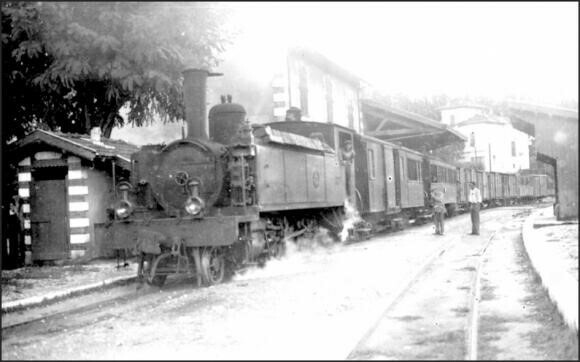 Banaudo highlights the fact that the locomotive in that image is a 4-6-0T but does not clarify which manufacturer. He does draw attention to the flat wagon at the left of the picture which he says must have come off the TAM network because of its narrower loading gauge. I have been consulting with 242T66 on “Les Passions Metrique et Etoile! !” Forum about some of the photographs in this blog. They comment that it is likely that the locomotive in the second image is an type E 4-6-0T because the type F had an air-compressor fitted to the right-hand side of the smokebox. It is possible that the locomotive is a SACM Series 81-86 rather than a Pinguely locomotive. Other people’s reflections on this locomotive would be appreciated. The next few pictures are taken at Vence Station. The first shows 4-6-0T No. 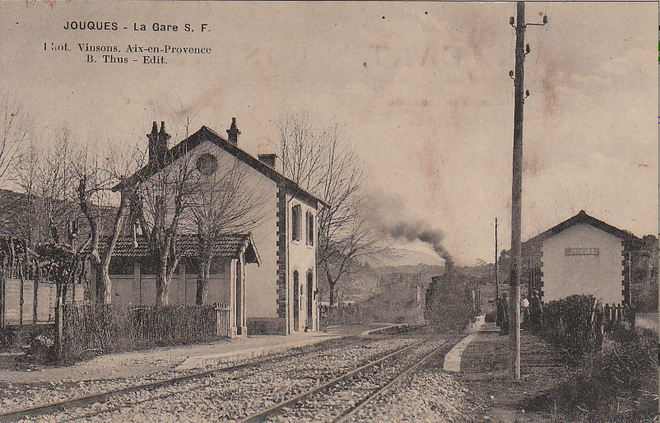 129 Franco-Belge on a long Grasse to Nice mixed train in the early 1930s. 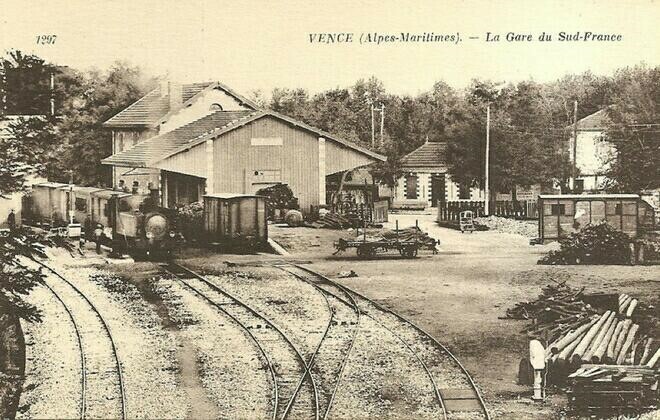 4-6-0T Pinguely on a Nice to Grasse mixed train is shown at Vence in the image below. 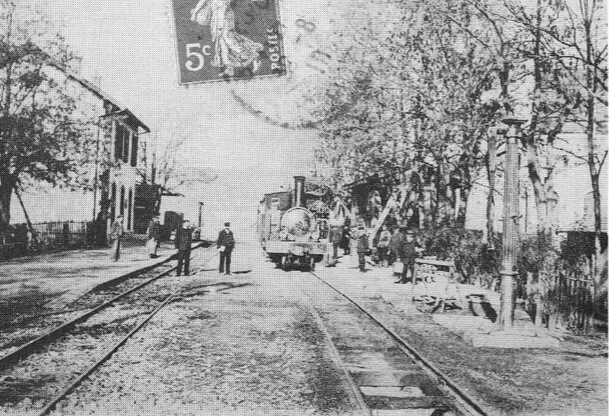 The van on the right of the picture is a wagon from the TAM tramway. The picture was taken after 1916 as the third rail has been lifted from the left-hand track. 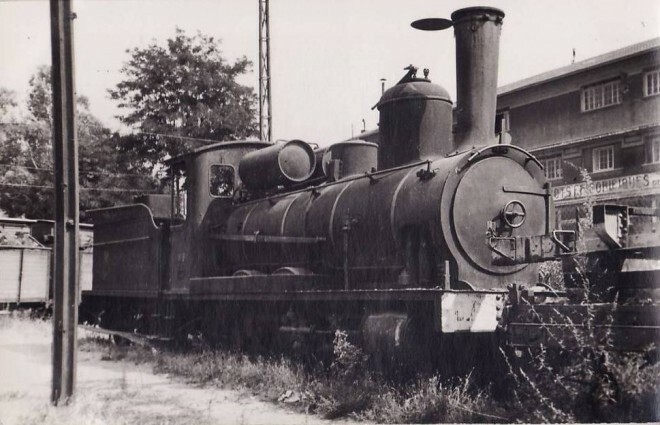 The locomotive in the image below is likely to be Class E 4-6-0T (quite likely it is a Pinguely, I am told, because of the bigger oil-lamp casing on top the cab). This is a relatively early picture because there is no evidence in the picture of the tramway and it appears that the third rail is still evident on the glimpse of the track to the left of the locomotive. 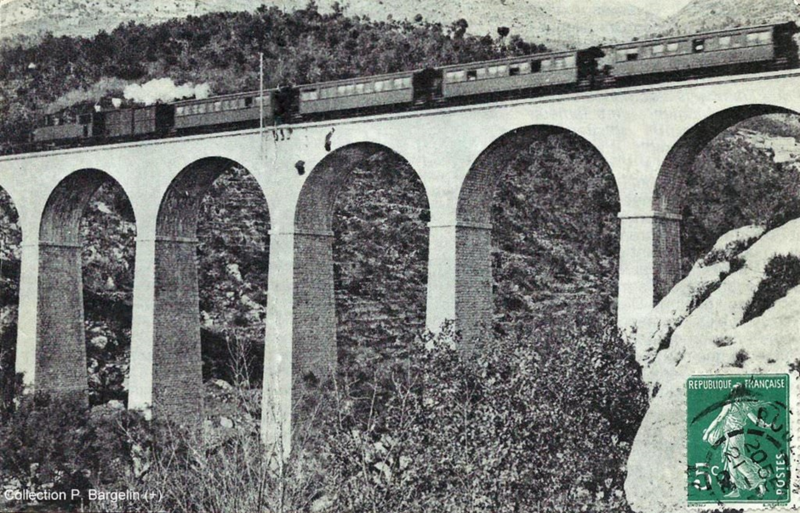 In the image below a passenger train heading from Nice to Grasse crosses the Viaduc de la Pascaressa, near Tourrettes-sur-Loup pulled by a Class E 4-6-0T, probably a Pinguely engine. 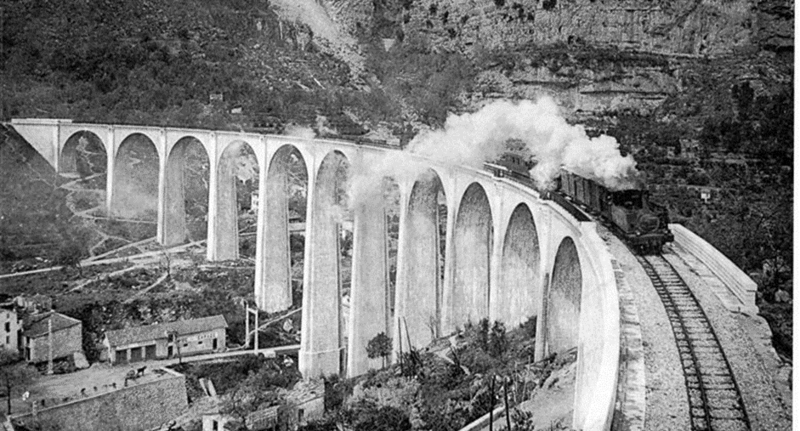 In this image of Pont du Loup a mixed train from Grasse to Nice is in the care of a Class E 4-6-0T prior to 1916 as the mixed gauge track is still in place. The locomotive is probably a Pinguely 4-6-0T. 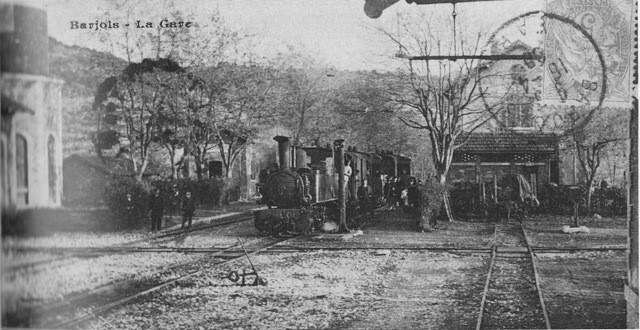 This image shows a Franco-Belge class E 230T at Claviers on a short Grasse – Draguignan working at Claviers. 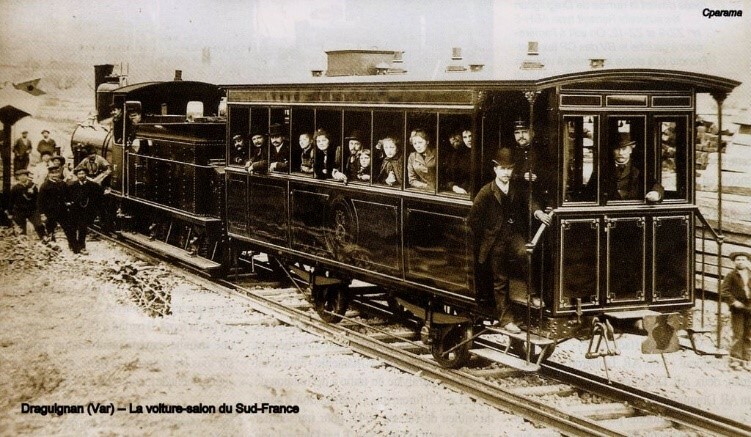 The Société Franco-Belge was a Franco-Belgian engineering firm that specialised in the construction of railway vehicles and their components and accessories. The company originated in 1859 as the Belgian firm Compagnie Belge pour la Construction de Machines et de Matériels de Chemins de Fer, founded by Charles Evrard. The company expanded its share capital in 1881 forming a new firm Société Anonyme Franco-Belge pour la Construction de Machines et de Matériel de Chemins de Fer and constructed a factory in Raismes (Valenciennes) in the Département Nord in France. In 1927, the company split into a Belgian (Société Anglo-Franco-Belge, SAFB) and a French company (Société Franco-Belge). The company’s factories were occupied during World War I, during which period it was used as a sawmill, and during World War II, during which period it manufactured Kriegslokomotives. SAFB merged with the Ateliers Germain in 1964; the company closed in 1968 due to lack of work. The Franco-Belge (based in Raismes) was acquired by Alstom in 1982, as of 2012 the factory Alstom Petite-Forêt, Valenciennes operates as an Alstom subsidiary, specialising in metros, trams, and double deck trains, A test track Centre d’Essais Ferroviaire is located west of the Raismes factory. In 1859, Charles Evrard acquired Parmentier Freres et Cie. based in La Croyère, (La Louvière, Belgium) and merged it with the Ateliers Charles Evrard (of Brussels, Belgium) to form the Compagnie Belge pour la Construction de Machines et de Matériels de Chemins de Fer (1862), (often referred to as Compagnie Belge pour la Construction de Matériels de Chemins de Fer). At the Exposition Universelle (1867) in Paris, the company exhibited a locomotive, passenger coaches, an iron goods wagon, and a steam rail crane. In 1881, the plant in Brussels was closed and the factory’s equipment was transferred, reducing pollution and other inconveniences caused to the populace of Brussels. The area of Molenbeek-Saint-Jean in Bruxelles, in which the Société Belge’s factory was located gained the nickname “le Manchester belge” due to the industry there. The company was restructured and named Société Anonyme Franco-Belge pour la Construction de Machines et de Matériel de Chemins de Fer. In 1882 a new factory was established in Raismes in the north of France, allowing the company to circumvent protectionism in the French market; initially the factory at Raismes in France assembled machines using components manufactured across the border in Belgium. All types of railway rolling stock were built. In 1911, the company was renamed Société Franco Belge de Matérial de Chemins de Fer. The company manufactured a wide variety of rolling stock (locomotives, carriages, specialised freight wagons) for clients, including the Belgian railways, private French railways, as well as exporting to Spain, Portugal, and other European countries; China, Turkey, and Indochina; as well as to African and South American countries. By 1914, the company had a capacity of around 50 locomotives and over 1,500 carriages and wagons per year; during German occupation during World War I, the plant in Raismes was ordered to carry out repair work, but this was resisted by the plant management – the factory was used under occupation as a sawmill. After World War 1, French and Belgian diverged. The French operations continued under the name “Franco-Belge”. The Société Franco-Belge was in operation from 1927 to 1981. Amongst other production in the 1930s, Franco Belge in Raismes manufactured Beyer Peacock designed 4-6-2+2-6-4 ‘Garratt’ locomotives for Algeria, and also carriages for an imperial train built for Emperor Haile Selassie of Ethiopia. The association as sub-contractor to Beyer Peacock continued to the 1950s. Over 80 Indian Railways WG class 2-8-2 locomotives were produced in the early 1950s before production capacity at the Chittaranjan Locomotive Works, India, was built up. The later history of the company can be followed on Wikipedia. 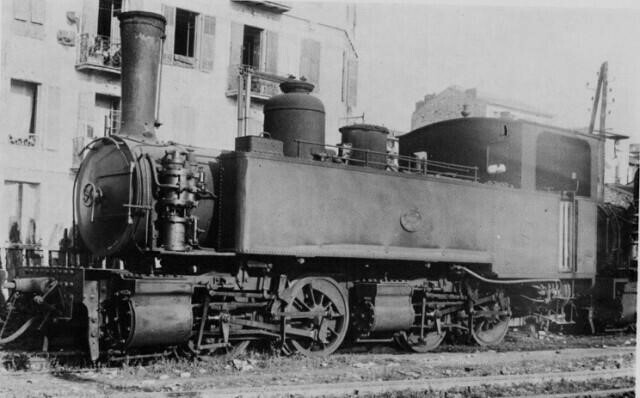 A whole series of different locomotive types were constructed by SACM, two were present on Le Chemins de Fer du Sud. SACM 2-4-2T Series No. 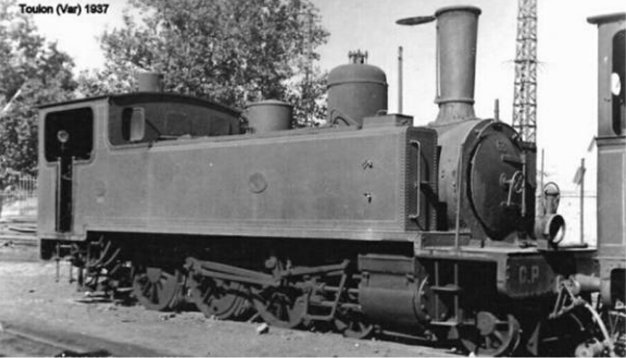 51-56, which were all in use on the Littoral line, Le Macaron, and SACM 4-6-0T locomotives. Series No. 61-62 were used on Le Macaron and the wider network. 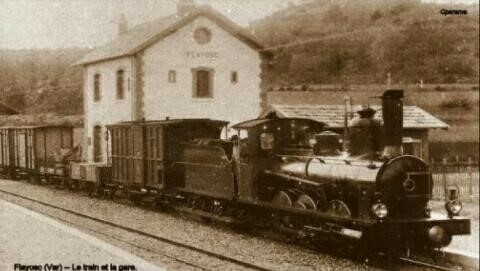 The image above shows what is probably a 4-6-0T locomotive at Callas Station. The arrangement of the front lamps seems to match that on the 4-6-0T locos elsewhere in this post. Other locos seem to have the lights more widely spaced. 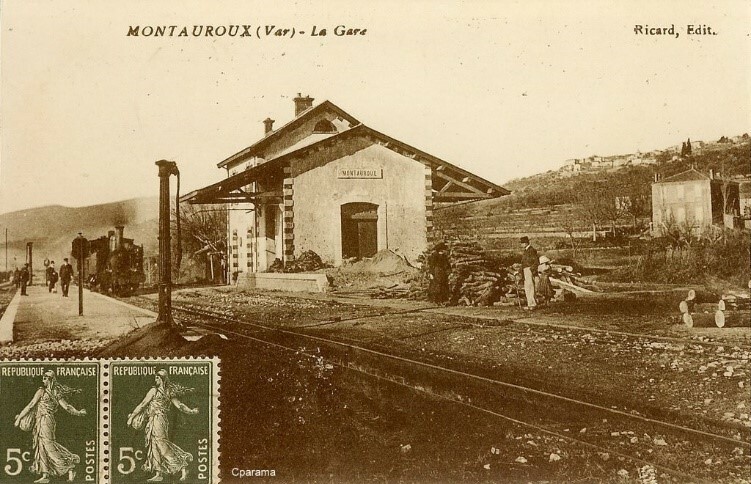 This image of the station at Montauroux is shown in Banaudo’s book but no details about the engine are provided. Sadly the station sign is placed so that the cab is not visible. All that can be said is that the cab does not curve downwards at the side but rather has a lip between roof and side. The overall impression, I get, is that of a 4-6-0T locomotive as it appears to have a front bogie. However, the definition of the photograph is not good enough to place any weight on this opinion. 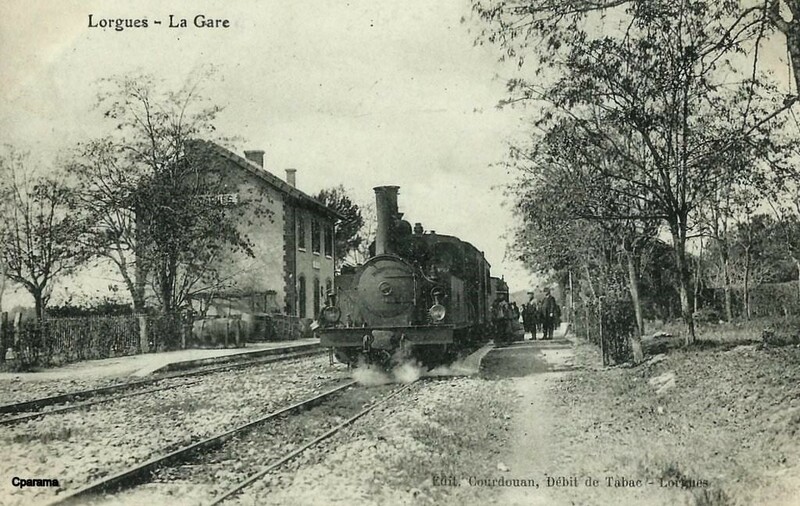 Here at Barjols a class E or class F 4-6-0T (230T) locomotive is in charge of a Draguignan bound train. Here a 4-6-0T (230T) enters Jocques Station. Mixed train travelling across Le Pont du Loup from Grasse towards Nice. 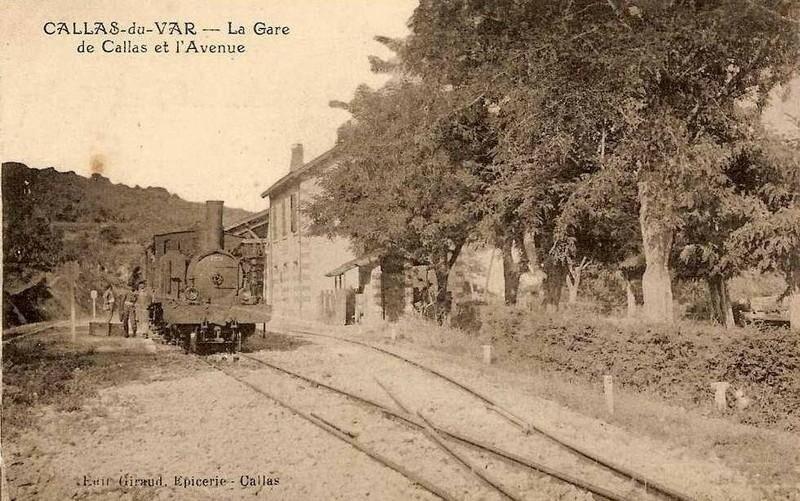 This image taken at Barjols station shows a train heading for Meyrargues headed by a SACM class C Mallet 0-4-4-0T (020+020T) locomotive. 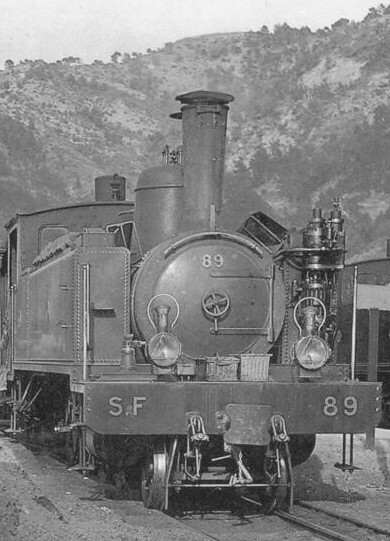 I believe that three of these 0-6-2T locomotives were purchased by the SF/CP and that they were all predominantly used on the Nice to Meyrargues line. 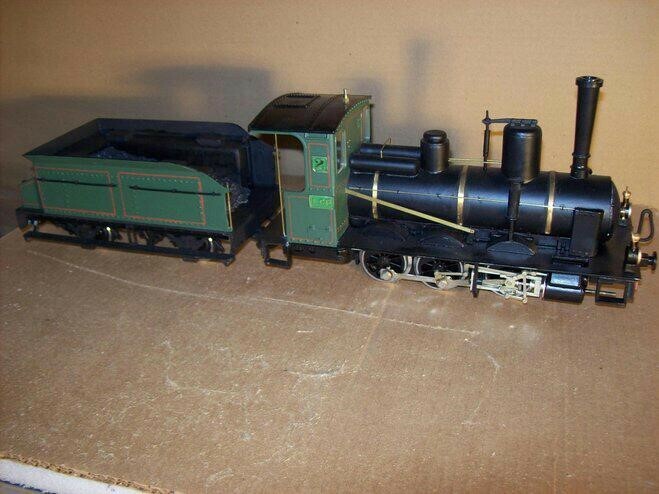 A very similar locomotive in model form. 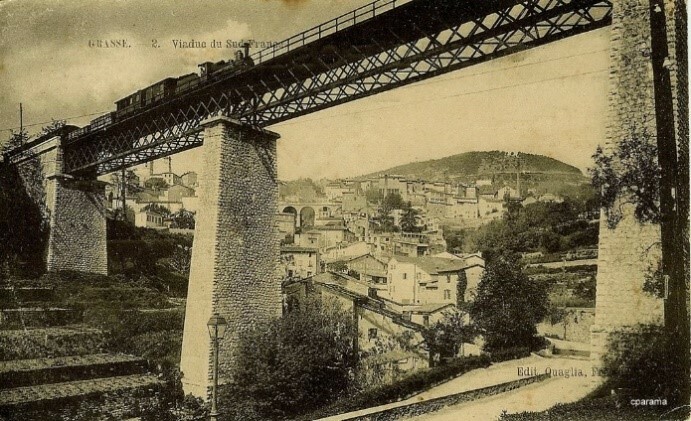 And finally, a distant view of what may well be one of these locomotives pulling a mixed goods and passenger train, leaving Grasse for La Manda and Nice across the Viaduc de Font-Laugières, near Grasse. The loco is either a Class A 0-6-0T SACM or Class B 2-4-0T SACM (built 1887/1888). These were almost identical engines, but for the wheel arrangement which is hidden by the viaduct girders. 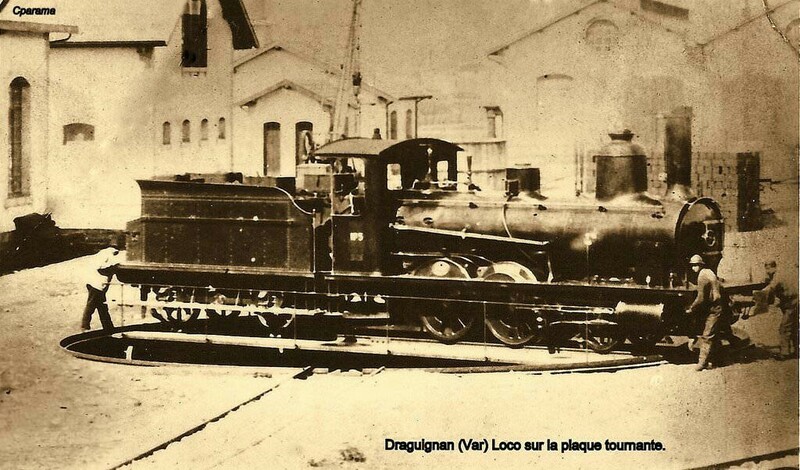 The next image is, I believe, an early photograph of one of the Class B locomotives on the turntable at Draguignan. 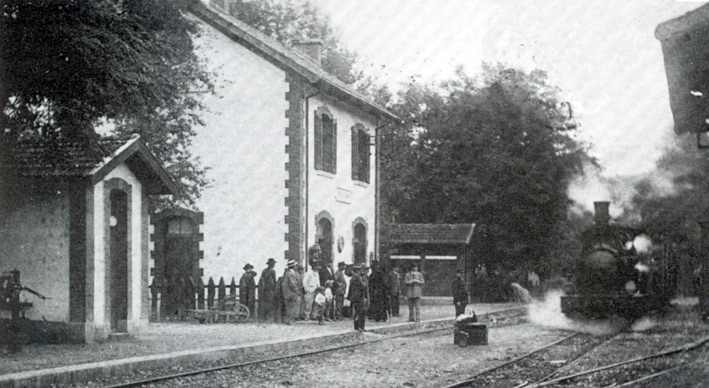 Banaudo says of the above picture, that it shows Claviers station after the lifting of the third rail. The locomotive in the picture has a narrower body than many others which suggests that it might be a tender-loco rather than a tank-loco. 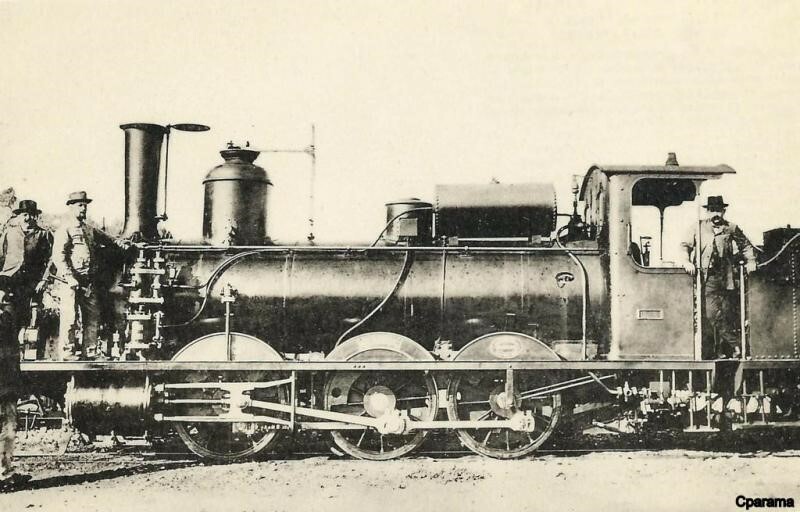 Image definition is not good enough to warrant any claim of certainty but it may be a SACM-Belfort 2-4-0 Tender Locomotive (Class B) or possibly a SACM-Belfort 0-6-0 Tender Locomotive (Class A). 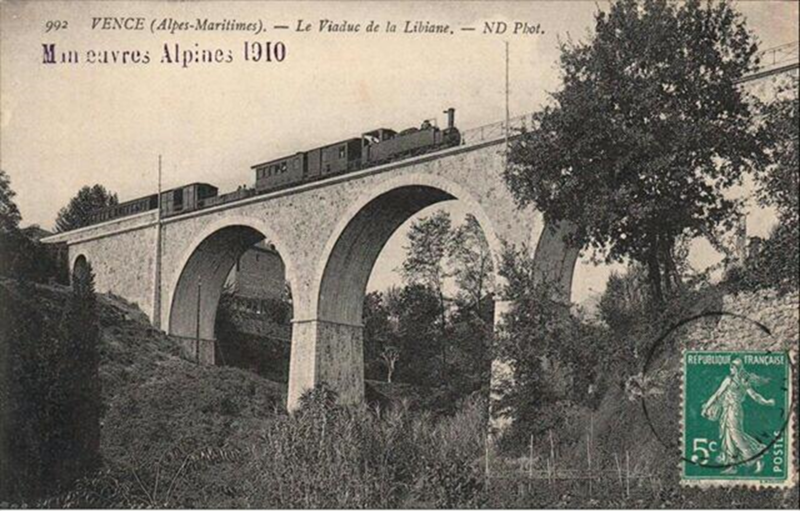 Aups-Sillans with a Draguignan to Meyrargues train hauled by a SACM class A or class B tender engine. 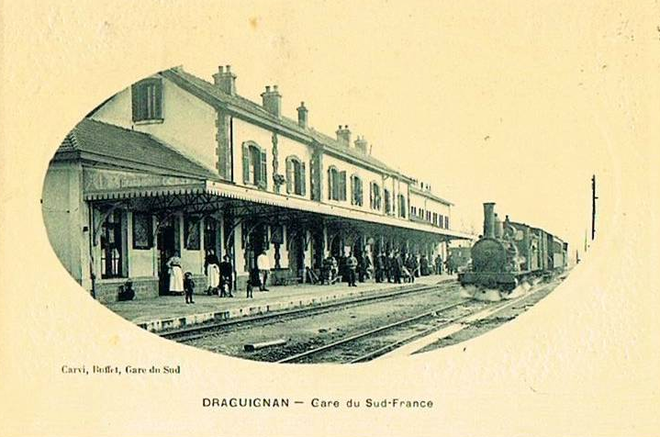 Here at Draguignan we have a view of the station building after it was rebuilt and extended (1905/1908) with a SACM class A or class B tender engine. The steam exhaust makes it impossible to tell whether this is an 0-6-0 or a 2-4-0 locomotive. Three further images of the Class B 2-4-0 locomotives pointed out y members of the Passions Metrique et Etroite Forum follow below. 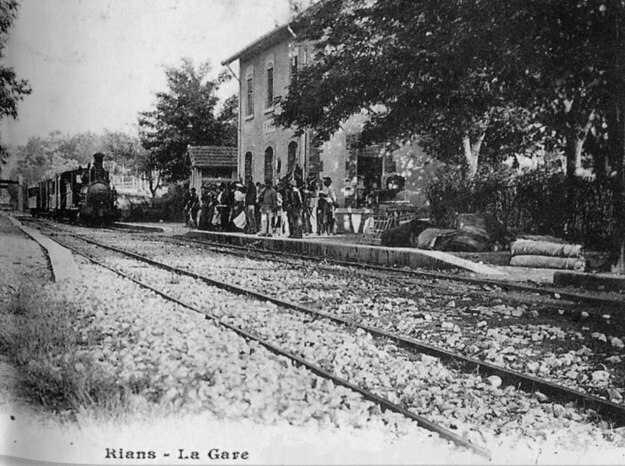 Here, a Class A 0-6-0 or a Class B 2-4-0 Tender Locomotive is in charge of a train at Rians Station, heading for Meyrargues. Four of these locomotives were in use on the network. As far as I am aware they were restricted to the Central Var Line and the Nice to Digne Line. They were built in 1894 and numbered 20 to 23. 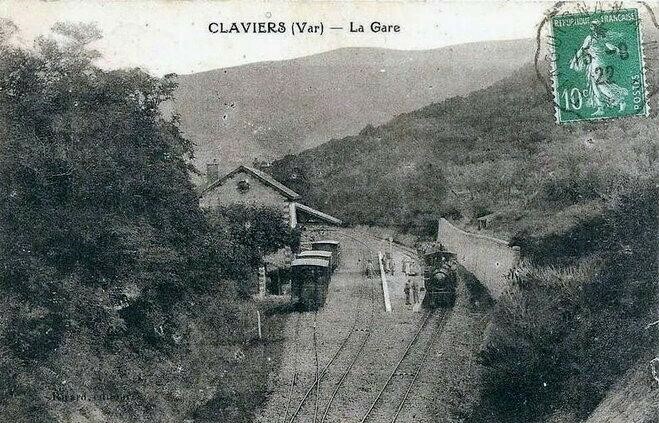 The image below shows one of these locomotives at Claviers. It has been suggested to me that the next image may well show an 0-6-2T (Class D) at Callas. However, the cab roof line suggests that it is not from the same batch of Corpet-Louvet 0-6-2T locomotives as the one above. For those interested in pursuing this issue the Passions Metrique Forum has a thread that is worth following. The different cab roof-lines can be seen in images of 0-6-0T (030T) and 0-6-2T (031T) locomotives on that thread. 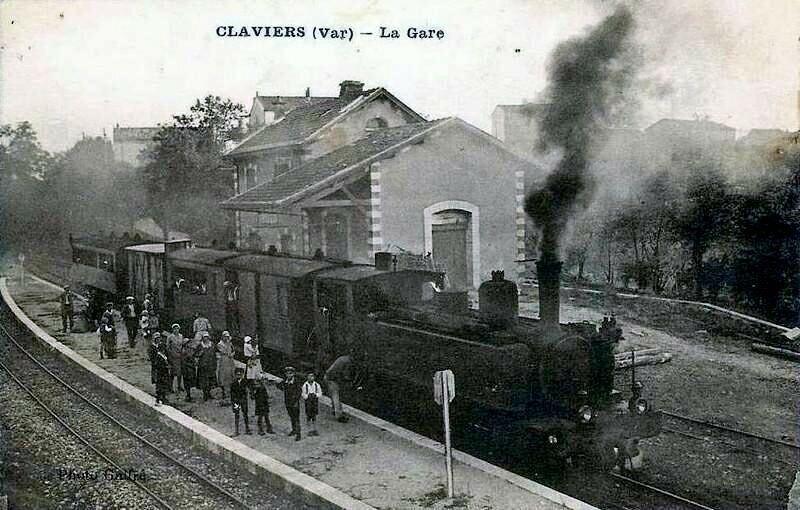 This Corpet-Louvet class D 0-6-2T (031T) locomotive is at Lorgues Station. 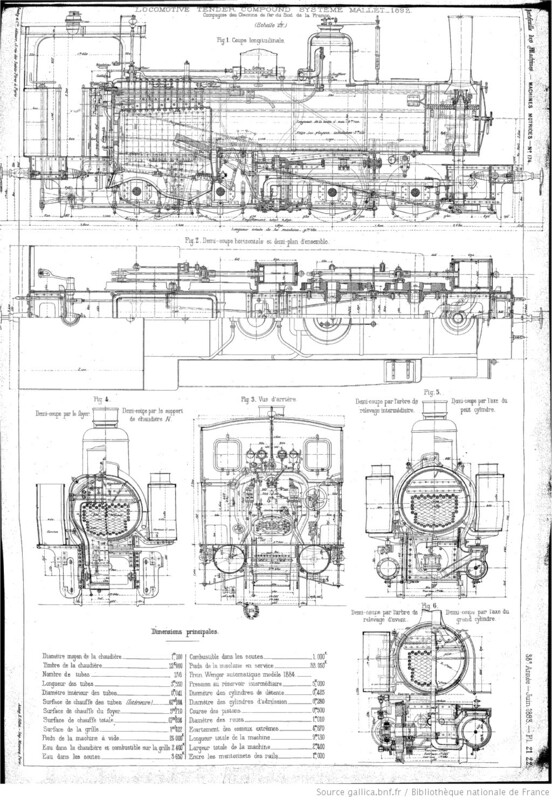 I am indebted to 242T66 who posts on the French Forum Passions Metrique for some of the notes about this class of locomotive. I know from earlier research that this class of locomotive was almost an accidental acquisition by the network. 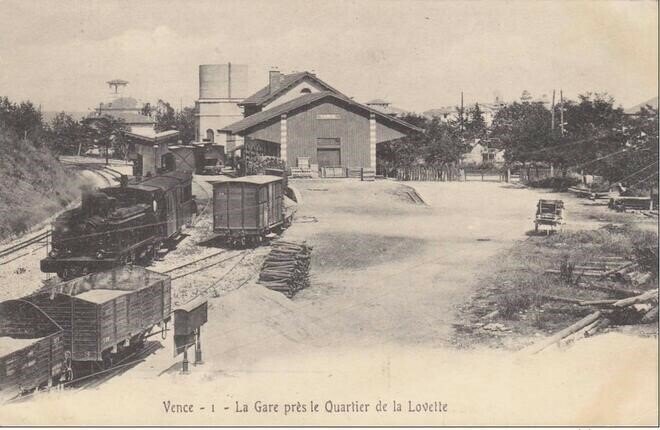 During the Second World War, the Littoral network received reinforcement from the largest steam locomotives that had ever been in regular service on a metre-gauge track in France. They were imposing type 2-8-2 tender locomotives (or Mikados). These machines were to be delivered to Senegal but their delivery was blocked. 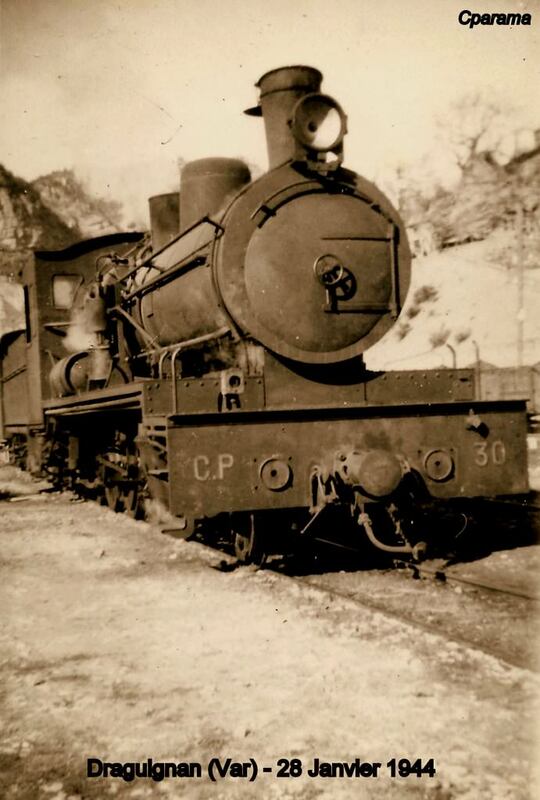 In the spring of 1943, 6 Mikado locomotives were allocated to the company’s network in the Alps and 3 others, numbered 21, 22 and 30 to the Littoral network. 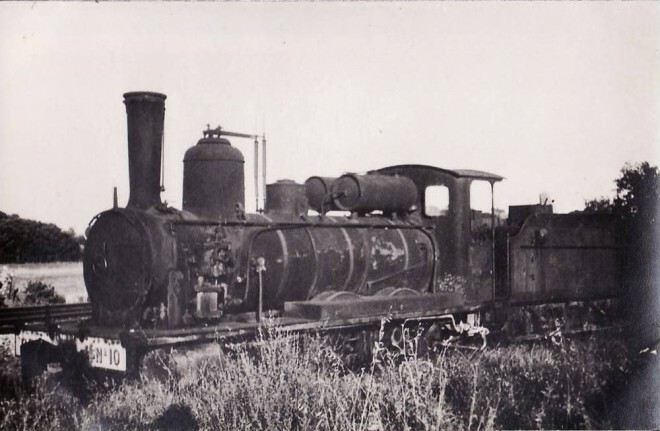 The image below comes from the collection of B. Roze and shows Corpet-Louvet Mikado 2-8-2 locomotive “Dakar-Niger” with its 16 cubic-metre bogie tender seen on the Littoral Line. The image below that shows Chemins de Fer Dakar-Niger, Corpet-Louvet 1736 of 1927. It was typical of a large number of metre gauge 2-8-2 tender locomotives built for service with the railways of French West Africa. Cylinders: 450mm x 550mm. Coupled Wheels: 1200mm. This is the same class of loco as the one shown in the first image. These locos ultimately proved to be unsuitable for the line between Toulon and Saint-Raphael with derailments being common because of their longer wheel-base that other locomotives on the line. 242T66 quotes Jose Banaudo in saying that: “Following an earlier successful series of 1927, 20 more 141 ‘Mikado’ engines (n° 40.011-40.030) were ordered from Corpet-Louvet for the Dakar – Niger railway shortly before the war. N° 40.011-016 were shipped to Dakar between August 1941 and February 1942 then the colonies of West Africa joined the Forces Françaises Libres (Free French Forces). To avoid the rest of the order to be stolen by the Germans, those Mikados that were completed were loaned to the CP in 1943.
. José Banaudo; Les Train des Pignes; Les Editions de Cabri, 1999.
. http://www.cparama.com/forum/colomars-t23738.html, accessed 12th February 2018.
. Roland Le Corff; http://www.mes-annees-50.fr/Le_Macaron.htm. Retrieved 13th December 2017.
. Wikipedia; https://en.wikipedia.org/wiki/Soci%C3%A9t%C3%A9_Franco-Belge, accessed 22nd February 2018.
. Odette Hardy-Hémery (1985), Industries, patronat et ouvriers du Valenciennois pendant le premier XXè siècle: développements et restructurations capitalistes à l’âge du charbon et de l’acier, (in French), 1, Atelier National Reproduction des Theses, Université Lille III, pp. 227–9.
. René Fruit (1963), La croissance économique du pays de Saint-Amand (Nord) 1668-1914 (in French), A. Colin, p. 230.
. Jean-Pierre Poussou; Francois Crouzet (2000), L’économie française du XVIIIe au XXe siècle (in French), Presses Paris Sorbonne, p. 248.
. Marie-Thérèse Bitsch (1994), La Belgique entre la France et l’Allemagne, 1905-1914 (in French), Publications de la Sorbonne, p. 220.
. Firmin Lentacker (1974), La frontière francobelge (in French), Service de reproduction des thèses, Univ. de Lille, p. 170.
. Oswald Stevens Nock (1975), Locomotion: a world survey of railway traction, Taylor & Francis, p. 223.
. Jeanne-Pierre Crozet; Francoise Faulkner-Trine, “Le Chemin de Fer Franco Ethiopien et Djibouto Ethiopien – Djibouti Addis-Abeba : The Imperial Cars”, www.train-franco-ethiopien.com, accessed 22nd February 2018.
. Indian Steam Pages – Post War Steam, Indian Railways Fan Club, IRFCA, Building locomotives at Chittaranjan, http://www.irfca.org/steam/postwar.html, accessed 22nd February 2018.
. http://www.passion-metrique.net/forums/viewtopic.php?f=2&t=8377, accessed 23rd February 2018.